The Royal Albatross can take up to 130 passengers a trip. A luxury tall ship that was featured in the 2008 Batman movie, The Dark Knight, is Resorts World Sentosa’s latest attraction. The integrated resort is offering weekend sunset sails on board the Royal Albatross. 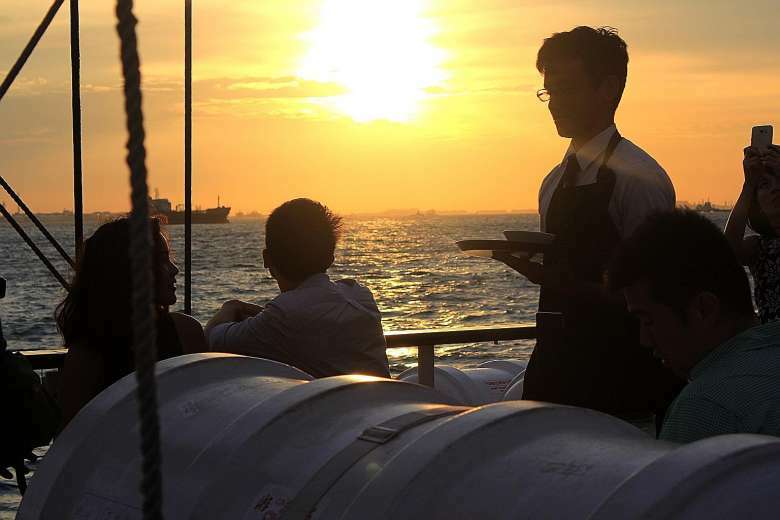 The first cruise sets sail at 6pm today and will take guests around Singapore’s coastline for 21/2 hours while they enjoy dinner, drinks and music on board. With its four masts and 22 sails, the Royal Albatross cuts an impressive figure at its berth along the promenade adjacent to Adventure Cove Waterpark at RWS. The ship boasts two bars, a restaurant-grade galley, a spacious top deck with retractable awnings and a variety of seating options, an air-conditioned middle deck with plush sofa seats and a lower deck that houses five en-suite cabins. The lower deck is closed during the sunset sail, but the cabins can hold up to 10 guests and are open to those who book the ship for overnight charters. Private charter rates start from $4,000. 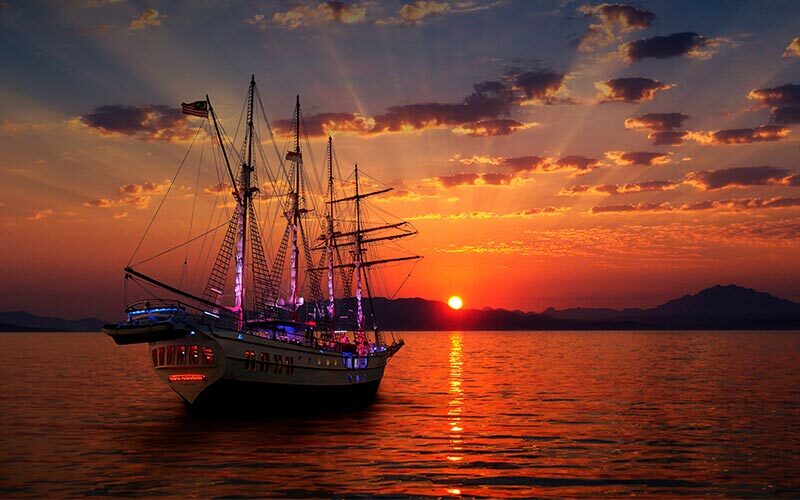 The sunset sail – priced at $195 for adults and $145 for children aged 12 and below – can take up to 130 guests a trip. The cruise departs every Friday, Saturday and Sunday. There is no minimum number of guests for the ship to set sail, but its owner, Mr Peter Pela, 58, hopes to have 100 guests on board each time. “This is a new concept in Singapore, so we have to build up awareness of the product. There is no similar experience here or in the region,” he says. The sunset sail allows members of the public to have access to what used to be an exclusive playground for invited guests of a private charter. The ticket price is inclusive of dinner, which includes pork ribs, steak, fish, chicken and housemade sausages that are barbecued on board. There are also salad options, fresh fruit and desserts such as grilled pineapple with brown sugar. A saxophonist will play live. As the sun sets, the more than 60,000 lights that the ship is decked out with will be switched on. The ship was built in 2001 in the United States and was then named Windy II. It was used as a training ship, where people were taught how to handle its sails. It then appeared on The Dark Knight as the private yacht of Batman’s alter ego, Bruce Wayne. Another noteworthy detail of the ship’s history is that its sails and rigging were designed by master rigger Jim Barry, who is behind the ships featured in the Pirates Of The Caribbean movies. Mr Pela, a former IT entrepreneur who is a permanent resident here, bought the ship in 2008 after hearing that its owner wanted to retire and was putting it up for sale. He paid “well into a seven-figure sum” for it and transported it across more than 15,000km from North America to Singapore. But when the ship arrived here, he says, for six months, he did not know how to monetise it. He spent some time studying the market, came up with a business plan and hired a team of professionals to help him transform the vessel into the luxury tall ship it is today. About 360,000 man hours and millions of dollars more went into redesigning and refitting the ship. A “massive challenge”, he says, was getting all the certifications and licences needed to operate a ship commercially here. Almost six years after Mr Pela bought the ship, it began its first private charter. It now has on average two private or corporate charters a week. It is valued at US$16 million (S$22 million), an amount that Mr Pela says reflects what he has spent. He adds that sales for the sunset cruise have been “encouraging”, although he declines to reveal the number of bookings received so far. He hopes the Royal Albatross will become a Singapore icon. He has plans to roll out new sailing experiences over the next few months, including a sunrise sail that will feature a harpist playing when dawn breaks, a Christmas-themed sail and a family-oriented pirate adventure sail. “I’m proud of what I’ve achieved. What gives me a real glow is when people tell me they appreciate what they experience on board the Royal Albatross,” he says.